The Foxboro Model 84 series intelligent vortex flowmeters are among the best performers on the market and designed for flexibility and reliability in harsh process environments. Available in flanged (84F), wafer (84W), and sanitary (84S) configurations, there is a meter for nearly every application. The 84S meets 3A sanitary requirements per specification 28-03. • Real-time Reynolds number correction. • Correction for piping effects. • Adaptive filtering for noise rejection at varying flow rates. • Automatic low flow cut-in. • Tuneable for specific operating conditions. • K-factor corrected for temperature. • HART communication protocol for measurement integration. • Process piping: installation parameters such as pipe bore, location of valves, proximity to elbows, etc. • Process temperature: correction for K-Factor shift due to change in the process temperature. • Operation at low flow rates: an algorithm, utilising values for density and viscosity is embedded in the meter to correct for nonlinearity in K-factor at low flow rates. • Low flow cut-in: eight user defined selections of LFCI. The instrument also includes an automatic low flow cut-in feature that can be configured to automatically select LFCI. • Signal conditioning: a digital smoothing algorithm can be enabled to condition the raw vortex signal. This results in improved performance, particularly at low flow. • Low and high frequency filters: these filters are set automatically based on the flowmeter configuration. • Adaptive filtering: the meter provides an adaptive mode which automatically adjusts the high and low frequency filters. Compact stainless steel sensor for conductive and non-conductive liquids. 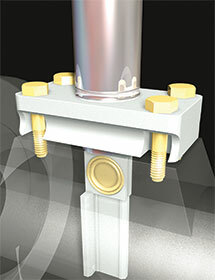 NAF’s advanced process valves solve pulp, paper and cellulose applications.